Nicely done, Mike! 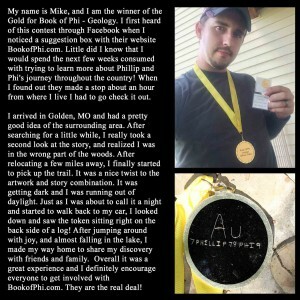 It only took two days for this clever soul to find the official token for Book of Phi – Geology, after which he received a solid gold American Eagle 0.5oz coin. Chapter Three Released – Book of Phi – Geology. . .. More Cash & More Gold! Book of Phi – Sports : Coming. . ..
We Have Video Channels. . .. And Videos!